Former Malaysian Prime Minister Najib Razak says he’s resigning as head of his Malay party to take responsibility for the electoral defeat that ended his coalition’s 60-year grip on power. A scandal-plagued Najib, who has been barred from leaving the country earlier Saturday, told a news conference that he will step down with immediate effect as president of the United Malays National Organization as well as chairman of the National Front coalition. He says his deputy Ahmad Zahid Hamidi will take over as president of UMNO, a party that dominates the coalition. 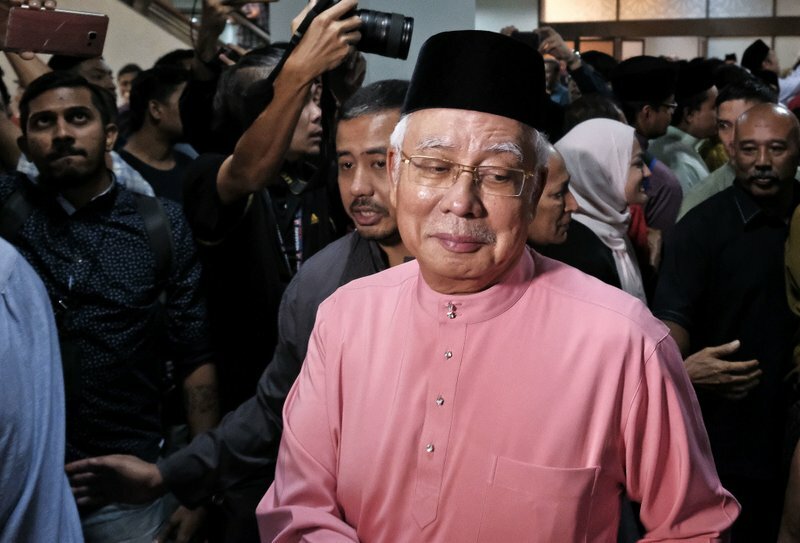 The announcement followed strong calls from the party for the 64-year-old Najib to step down over the disastrous loss in Wednesday’s elections. The National Front obtained only 79 of the 222 parliamentary seats, losing power to a four-party opposition alliance headed by veteran politician Mahathir Mohamad. Malaysia’s Immigration Department says former Prime Minister Najib Razak and his wife are not allowed to leave the country. Najib, whose coalition was ousted in Wednesday’s general elections after 60 years in power, earlier said he planned to take a short break to spend time with his family. His holiday plans fueled rumors he was fleeing the country to escape possible prosecution over a massive corruption scandal but Najib denied this. Former Malaysian Prime Minister Najib Razak says he will take a short holiday to spend time with his family after a shocking electoral defeat that ended the 60-year rule of his coalition. In a statement Saturday posted on social media, Najib says he’s committed to facilitating a smooth transfer of power and called for unity after the divisive polls. His holiday plans come as calls emerged from his ruling Malay party for Najib to step down over the election results.